When we first arrived, we didn’t have much bird action. 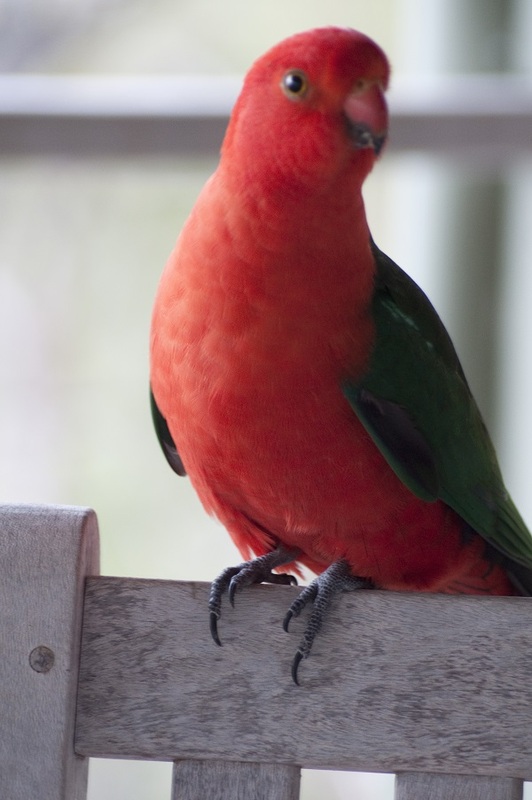 But soon we had a regular visit by a male king parrot. It didn’t take long before he was eating out of our hand. We have named him Charlie. It seems that once the birds noticed we were here they started to come looking for food. 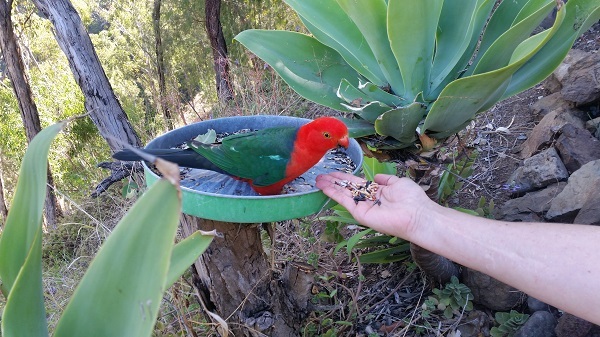 Our take on feeding wild birds, is we only are supplementing their diet and they actually enjoy the human interaction as much as we do. Charlie visits on a daily basis, usually showing up early in the morning and late in the afternoon. Often we will hear him long before we see him as he flies up from the valley below announcing his arrival. Lately his friends have been visiting as well, although Charlie is the only bird to eat from our hand, another dominant male will try to shoo Charlie away from the seed, but he stands his ground. The other birds, including a few females which have been rare, will not eat as the dominant male keeps them away. Charlie will also follow us around the property or come and find us if we are out walking. He has taken to following Dave around while he is working, where he’ll sit in the trees nearby and eat his native seeds, quietly chirping to let Dave know he is there. We’ve seen him eating Acacia seeds as well as red bottle brush (Callistemon) seed. We picked a few and tried to feed them to him at home, but he wasn’t happy with that. He picked them up and threw them away. Obviously he enjoys his treat of the sunflower seeds that we provide. 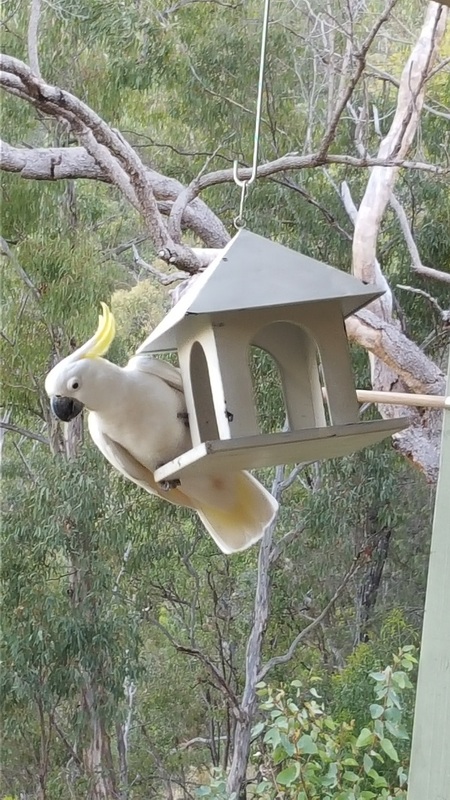 The sulphur Crested Cockatoos have also started to visit. Unfortunately this guy doesn’t quite fit in the bird feeder, so we put seed on the railings and they eat with a cautious eye on us if we are around. They are great cleaners, getting on the ground to pick up seed that the King Parrots might have dropped. We have also created a watering hole for our birds. 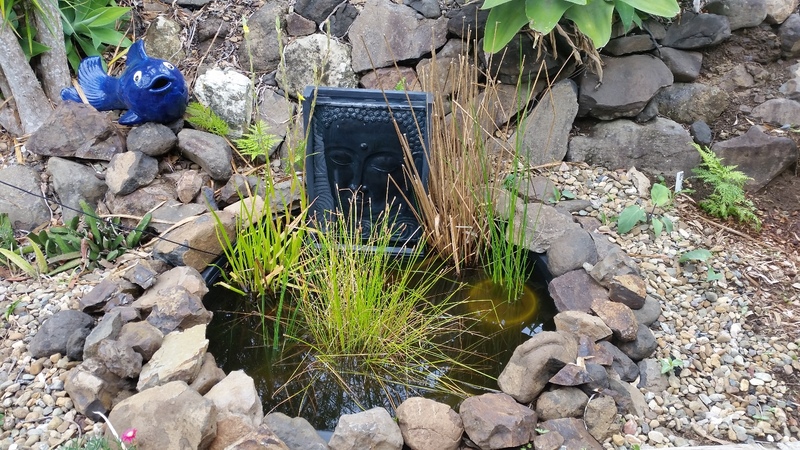 They love to drink from the water feature which has also attracted frogs and flying insects looking to cool off in the heat of the day. We are running a solar pump to keep the water fresh. 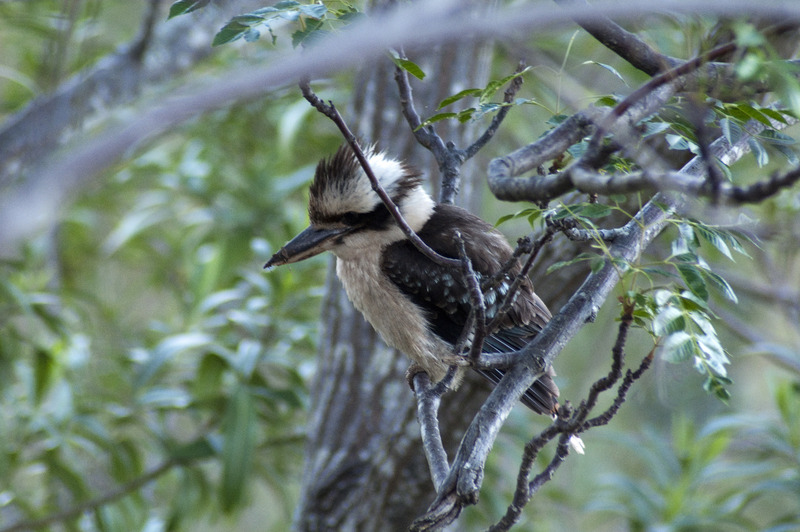 The Kookaburras sit in the tall trees around the house watching us as much as we watch them, it seems. They swoop to the ground, pick up their prey and take it back to the high branches to beat it with their beak and then feed it to their young. Enjoying the serenity with only bird calls to interrupt the silence is one of our favorite aspects of living off the edge.